WHMCS is a very comprehensive and complete billing solution for online businesses. If you are an online business owner and are tired of manually billing your customers. Then WHMCS is the best service you can get to make your life easier. WHMCS makes the life of an online businessman that much easier and also provides you professional looking outlooks. Want to bill your clients in a timely and well managed fashion, then WHMCS is all you need. WHMCS is a well-rounded billing, client management and support solution of online business. It provides you a simple way of setting up packages and get a shopping cart up and running on your website. WHMCS is also capable of auto provision hosting accounts with the help of all major hosting control panels like cPanel, Plesk and Direct Admin etc. It can also handle domain registration through almost all major domain registers like Reseller Clun, Directi, Register.com and eNom including many others. WHMCS is mostly used by website hosting companies who need it completely automate their hosting businesses. It is also used by a few online marketers which allows them to do automated billing . In this modern age, automated billing is the only way to go. WHMCS is an essential tool for those who have an online business and need to send regular invoiced to their customers. Getting WHMCS and making the whole process automated is the best way to tackle the task and save precious time. Fully Automated – WHMCS gives you hands free automation and it is all about doing things own its own without the need of human intervention. Automatic Provisioning, Domain Management, Welcome Emails, Reminders, Billing and anything you can think of is covered by WHMCS. This makes life a lot easier for those business owners who need to interact with their customers on a daily bases. 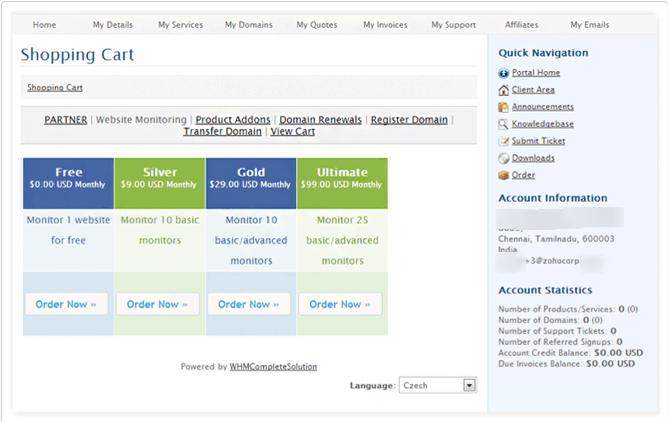 Domain Management – WHMCS makes domain management a breeze. With WHMCS you can buy, transfer, renew and manage domains all in real time. The best past is that you won’t even have to leave your website to achieve this. They provide you with fully transparent, powerful and automated domain tools. Currency variety – When you are doing business online you and you are dealing in only one currency, you are limiting your business to a specific region only. But with WHMCS with you, you are not limited to one country or region as they provide multiple currency support. Why become limited when you can expand to other regions by welcoming payments in their local currency. Support tools – WHMCS gibes you built in support tools which include announcements, knowledgebase and a fully featured support ticket system which makes it extremely convenient to keep track of enquires and keep customers well informed. Many Payment Gateways – WHMCS has integrated almost all the leading payment gateways, provisioning systems, domain registrars and other service provides which makes the able to fully automate and integrate all the services in one convenient system. From PayPal to Nominet and from 2CheckOUt to Quantum Gateway, all are included in WHMCS. Great looking invoices – We really don’t like generic and simple invoices, we want details which are clear and satisfy the customer fully. 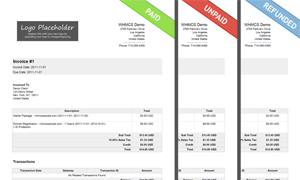 Thankfully WHMCS has us covered when it comes to generating great looking yet professional invoices. This may not be much of a deal to you as a business owner but the customers will really appreciate the detail in the invoices. The WHMCS while may seem initially high, is relatively small when compared to their similar services. The lease licenses of their service and have various packages. The monthly lease costs $15.95 per month which is not that expensive when you consider the amount of content and services you are netting. The Monthly lease with no branding costs $18.95. If you want to own a license you can also do that with onetime payment of $249.95, this is what we recommend as you will be using the service for a long period of time. If you want the no branding version of the license, it can be yours for a onetime payment of $324.95. 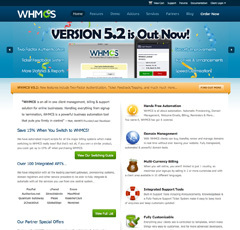 There aren’t many problems or disadvantages of using WHMCS over any other service. HostBill do have more releases than WHMCS but they are sometimes buggy. Also WHMCS is a bit harder to update than other similar service providers out there and my cause you some delays while you grasp the methods. Otherwise WHMCS is a well-rounded and comprehensive online billing solution. Support at WHMCS is divided into four parts, you can either read their documents and knowledgebase, watch video tutorials or ask the community about your problems and concerns. You can also contact the WHMCS staff directly by submitting a support ticket. Overall the technical support at WHMCS is responsive and give constrictive input on your problem. It is nothing remarkable but gets the job done in a timely manner. WHMCS is a great way to bill your customers or implement a shopping cart on your online store. Every business needs automation at some point and the sooner you get WHMCS the more time you will have tending to the important matters. Invoicing, billing and announcements can all be automated by using WHMCS and it makes your job really easy. Manually doing these menial tasks require a lot of input from you and can make you lose precious time which is better implemented elsewhere. Although the price may be a bit higher than you expect, WHMCS provides you with a quality service that not only streamlines your online business conducts but also opens further possibilities for expansion. All in all WHMCS is among the best automated billing systems available in the market. We recommend that you at least try out the demo of WHMCS before committing to another service which may or may not be of the same caliber as WHMCS.